Two transit lines serve the Clovis area. Stageline operates along fixed routes with regularly scheduled stops. Round Up is a demand-response service for disabled residents who call in advance to schedule trips. Stageline operates weekdays from approximately 6:15 am to 6:15 pm. Please view the maps for limited Saturday service. FAX route 9 operates in Clovis on Shaw Avenue weekdays from 6:30 am to 7:30 pm and weekends from 8:11 am to 3:15 pm. 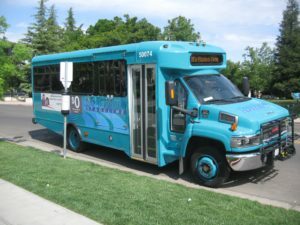 All Clovis transit vehicles – Stageline buses are teal-colored with the transit logo and Round Up buses are red, white and blue — are accessible in line with Americans with Disabilities Act standards. Stageline serves the Clovis community with routes that operate from 6:15 am to 6:30 pm Monday through Friday and limited Saturday service. 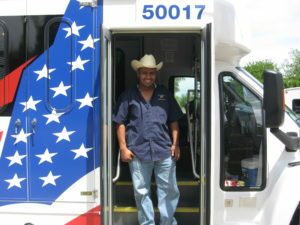 Stageline service runs Monday through Friday, with limited service on Saturday. 10-ride passes are $11.25 and valid on both Clovis Stageline and FAX buses. 31-day passes are $48.00 and valid on both Clovis Stageline and FAX buses (replaces the Metro Pass). Valid for 31 days from first use. Clovis Transit has discontinued the sale of the 20-ride Stageline pass. Any green passes still in circulation will be accepted. *Proof of disability for reduced fare includes any of the following: Medicare card, DMV issued disabled placard, FAX special rider ID card, Fresno Handy Ride ID card, or disability identification from any public transit agency in the United States. Round Up offers service throughout the metropolitan area, providing rides for disabled residents of Clovis who need to travel in Clovis, Fresno and nearby areas. Riders must complete and submit an Americans with Disabilities Act form and be approved for eligibility before using Round Up for the first time. The form is available by telephoning (559) 324-2760 or by clicking the link below. If you have been certified as eligible for ADA paratransit service by another transit agency and have proof of your certification, you may ride for 21 days while your application is being processed. Riders may phone to arrange a ride up to 14 days in advance, but at least the working day prior during regular office hours. Riders may call (559) 324-2760 to schedule a ride. See the Roundup brochure for more information. One-way fares for Round Up within Clovis are $1.25. Travel to Fresno ranges from $2.00 to $2.75. New passes for Round Up are now available. Passengers purchase a $25 pass ($27.50 value) to use with the new electronic fare boxes. Clovis Transit has discontinued the sale of the punch passes (pink, blue, and purple). Any of these passes still in circulation will be accepted. Round Up service hours are 6:15 a.m. to 6:15 p.m., Monday through Friday, and from 7:30 a.m. to 3:00 p.m. on Saturday and Sunday. Round Up weekend service is limited to trips in Clovis only. Service to Fresno is 7 a.m. to 4 p.m. Monday through Friday. In the event of a mass disaster, Clovis Transit will make available its Emergency Evacuation Database to Clovis Fire Department to assist in evacuation planning for residents who may require transportation assistance. Any Clovis resident who may need transportation assistance in the event of an emergency requiring evacuation can call Clovis Transit at (559)324-2770 for more information. The information in the database will be used by emergency responders to determine what type, if any, of transportation is needed. Reasonable Modification Request 2019Reasonable Modification Policy 2019It is Clovis Transit’s policy to make reasonable modifications to its policies, practices, or procedures when requested to do so by individuals with disabilities. The modification is not necessary for the individual with a disability to fully use Clovis Transit’s services, programs, or activities for their intended purpose. In determining whether to grant a request for modification, Clovis Transit will review and consider all aspects of the requested modification as outlined in this policy, including but not limited to, the similarity of the request to the examples outlined in the provisions of United States Department of Transportation 49 CFR Appendix E to Part 37.169; such examples will be used as guidance in making a determination if the request is a reasonable modification. Need to transport a large group? The Clovis Transit trolley bus can accommodate 26-30 passengers in comfort. Trips must be within 50 miles of the City Corporation Yard at 155 N. Sunnyside Ave. Trips starting with Clovis City Limits: Rental time starts at the pick-up address. Trips starting outside Clovis City Limits: Rental time starts when the trolley leaves the City yard at 155 N. Sunnyside Ave.
After the initial two hours, consecutive waiting hours are $50.00 per hour wait time for when the driver is waiting but the bus is not in motion. After the initial four hours at the full-price rate, a reduced rate of $75.00 is in effect. Refunds are not given for unused time. At the time of booking, carefully consider the time needed for your event. An additional $100 fee will be charged in the event of a bodily fluid clean-up. A $50 fee will be charged if the vehicle is left in poor condition: trash, spills, etc.